Personally, there are two Becky's that made me fall in love with using sketches - Becky Higgins and Becky Fleck - and I'm sure I'm not the only one that uses sketches as a valuable tool in their scrapbooking. While I don't start every layout with a sketch, they have helped me out in more than a few cases of scrapper's block. 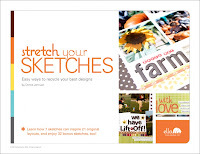 However, there could be no more worthy author of Ella Publishing's newest eBook offering - Stretch Your Sketches. 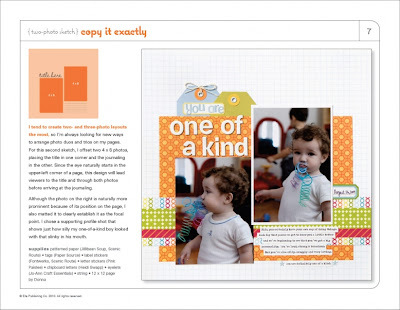 Author Donna Jannuzzi states in her introduction, "I start every single layout with a sketch." In the book, she offers seven sketches starting at one photo and working the way up to a seven-photo layout. Each of these sketches includes three layout examples. The first one always follows the sketch exactly while the other two (one 12 x 12 and one 8 1/2 x 11) examples show how to 'stretch the sketch'. In all, there are 14 variations to give you ideas for how to start with a sketch, but end up with a layout that is uniquely your own. At the end of the eBook, there is a 'Sketch Gallery' that includes two more variations of each of the seven sketches AND a 'Bonus Sketch' section that includes 18 of the authors favorite sketches. So there are actually THIRTY-NINE sketches included in this great eBook! If you are a lover of sketches, this eBook is a must-have for your inspiration library. Contributors for this book include Jodie McNally, Monica McNeill, Barb Wong, Tami Morrison, Lisa Kisch, Linda Barber, Noel Culbertson, Pam Young, Margie Scarpignato, Katie Scott, and Kathy Thompson Laffoley. To check out the other great Ella Publishing Co. eBooks, check out their website. Random.org will select the winner on Saturday. Be sure to come back to find out if you've won!